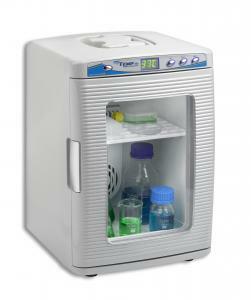 The Thermo Plate Shaker Incubator adopts micro-processing techniques combined with PID (proportional-integral-derivative) control to achieve a low profile, quiet, safe, and customizable machine that transports easily. It is primarily used for solution incubation of ELISA plates (96-well) and cell culture plates (24-well), and for mixing and incubating samples in micro-plates, cell culture plates, and other standard plates at proper temperature. LCD Display – Simple interface with temperature, shaking speed, and time setting. 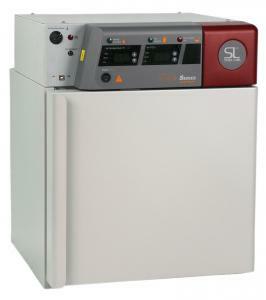 Uniform Heating – Precise and uniform heating from both cover and bottom, two-sides heat each plate hole evenly. 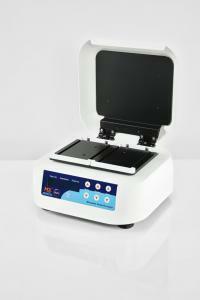 Microprocessor – Allows for precise control and calibration of temperature and shaking speed. Versatile – Configure two plates (for model MX-TS72) or four plates (for model MX-TS64). Not included. Memory Feature – Machine remembers the last setting even after powering off.